Continental Biomass Industries, Inc. has introduced the Magnum Force Disc Chipper 754 and the Flail 604 debarker/delimber. The Magnum Force Flail 604 is a 4-roll flail design engineered for the highest volume debarking, while reducing fiber loss, chain wear, and fuel consumption. An enclosed system, with no exposed drive components, contains debris and drastically reduces maintenance and fire hazards. Full width, large diameter feed rolls ensure continuous positive feed and provide incredible throughput — 150+ tons per hour. The large capacity Tigercat loader allows more wood per grapple and remotely controls both the chipper and flail from the cab. inexpensively mounted as an aftermarket installation. The new Mechanical Suspension Onboard Scale requires no welding or special tools and can typically be installed in one hour on tractors and trailers with walking beam, leaf-spring, and other mechanical suspensions. The Primex LS Xtreme LS-2 is no ordinary forestry tire. The variable-angle, tapered lug design delivers exceptional performance in a wide array of terrain and soil conditions. It’s exceptionally stable on steep hillsides, delivering market-leading traction in virtually all soil conditions: sand, mud, clay, and everything in between. And it never gives up. The outstanding resistance to cuts and chunking is thanks to the Xtreme’s specially formulated forestry compound. 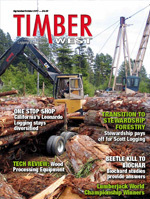 The heavy sidewall and deep under-tread gauge also provide long-lasting durability to keep harvest teams — and logs — moving. The Advantage 3 is Morbark’s new high performance chipping drum. It now comes standard with all Morbark’s heavy-duty industrial drum chippers and can be retrofitted to most existing machines without modifications. Not only does the drum produce improved chip-quality in large volume wood-chipping equipment, it substantially reduces recurring-wear part and maintenance costs more than 70 percent, due to AR 400 heat-treated steel skin, enhanced knife design, and recessed pockets. 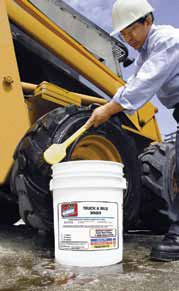 The new eco-friendly Oil Eater industrial strength wash is a high-foaming, low VOC cleaner/degreaser formulated to instantly dissolve grease, diesel, grime, bird droppings, and more from trucks and heavy equipment with spot-free results. Ultra-concentrated, Oil Eater is non-acid, non-corrosive, non-hazardous, completely biodegradable, and can be diluted up to 100:1. It works in hard and soft water, lubricates brushes, and is ideal for automatic and high-pressure self-service systems. John Deere’s new FR21B high-rotation felling head, available on its 700J-Series Tracked Feller Bunchers, provides faster cutting speeds to help loggers be even more productive.